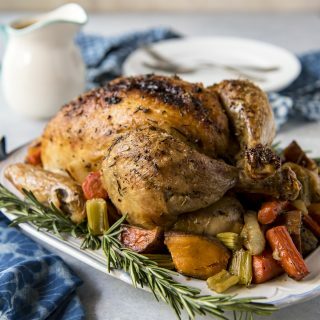 Simple and classic, this may very well be the best oven roasted chicken you’ve ever had! 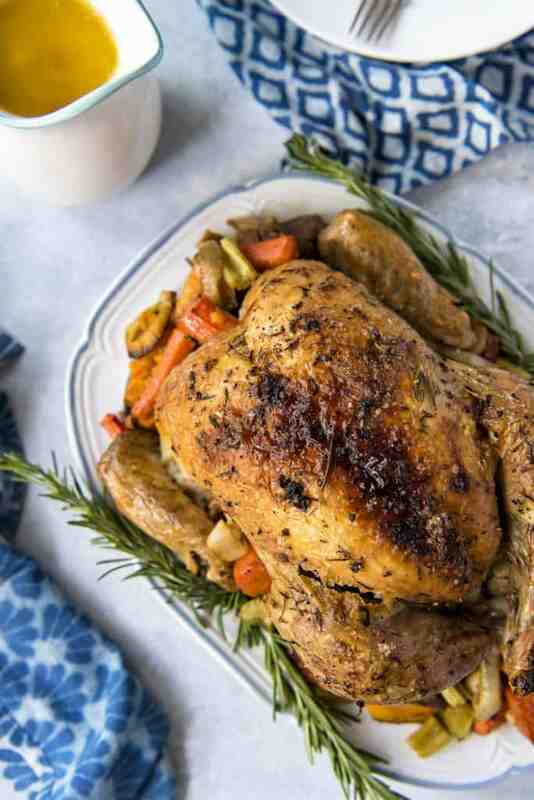 Stuffed with garlic, lemon, and rosemary, and roasted with root veggies, this heavily seasoned roast chicken recipe has a secret ingredient that keeps the inside juicy, the outside crispy, and the pan gravy extra delicious! Have you ever made a dinner so good that your plate never even made it to the table? Honestly, Abe and I eat right on our kitchen island pretty frequently. As much as we both like to enjoy an actual sit-down meal, sometimes we’re both so busy that we just end up there. No stools, no drinks – just our forks and appetites. Sometimes, the meal demands that kind of dinner. This oven roasted chicken was totally one of those meals. Between the ridiculously juicy chicken inside and the crispy, salty skin on the outside, neither of us could stop picking the bird apart. The only reason we even used plates was because of this photoshoot. We’re not usually whole chicken-type folks. Boneless breasts and thighs are our go-to cuts since they’re so quick and easy to throw together in so many different recipes. Sometimes, though – like around a holiday where we know we’ll be flying solo and need a smaller meal – a roast chicken is perfect. 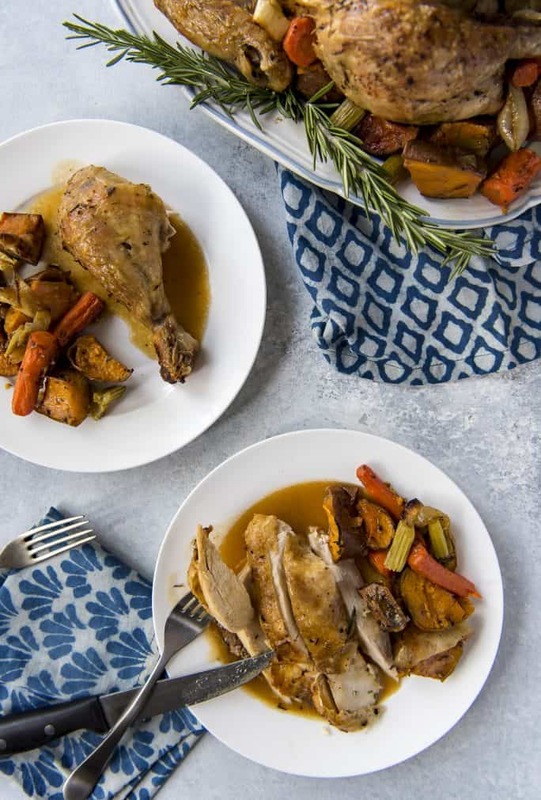 While some people would rather cook a bird in their Instant Pot (speed) or slow cooker (convenience), 90 minutes in the oven for an epically delicious meal is completely worth it. So the “secret ingredient” in this roast chicken recipe isn’t truly a secret. It’s butter. Lots and lots of butter. Easy homemade herb butter, to be exact. A stick of soft butter, salt, pepper, minced garlic, and whatever fresh herbs you happen to have on hand, all blended together. It’s my favorite reason to have a little backyard herb garden! For full flavor, make sure you butter that bird all over – not just on top. Carefully peel the skin up from the meat and rub it everywhere – it is guaranteed to soak in and create the tastiest, most intensely juicy chicken you’ve ever tasted! Plus, the butter + olive oil-basted outside means crispy skin everyone is bound to be fighting over. You can totally tell by looking at that pudgy little leg just how crispy that skin is, can’t you? What goes in a roast chicken? Honestly, anything. As long as there are aromatics in there, you’re going to end up with an amazing dinner. I usually go the traditional route – lemon, garlic, and rosemary (or thyme). You would be absolutely amazed at how much flavor those three things infuse the chicken with! This dinner is what dreams are made of. 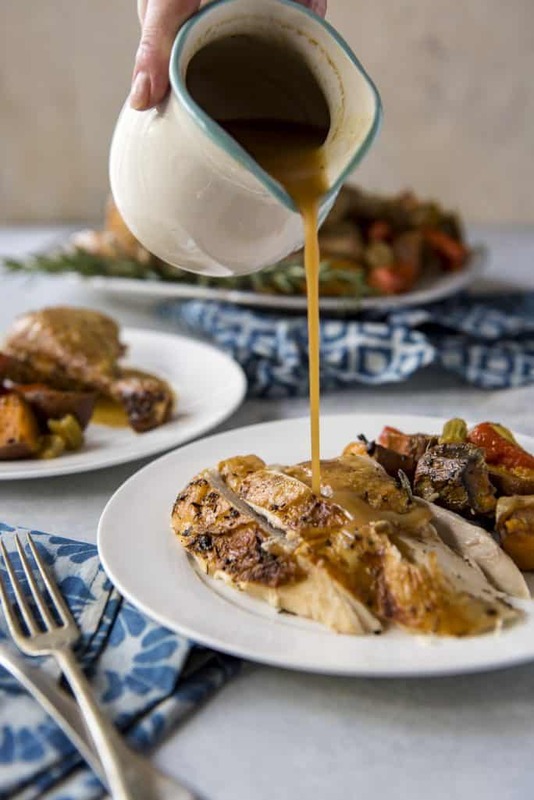 Top it off with a luscious, homemade pan gravy and you’re definitely gonna need an after supper nap. So…how do you make a perfectly juicy, crispy oven roasted chicken? 1. Preheat oven to 425 degrees F. Prepare the herb butter and chill. 2. Remove the giblets from a 5- to 6-pound bird. Pat the outside dry with paper towels. Liberally salt and pepper the inside of the chicken then stuff the cavity with rosemary, lemon halves, and garlic cloves. , and tuck the wing tips under the body of the chicken. Place onions, carrots, celery, and sweet potatoes in a roasting pan. Toss with salt, pepper, chopped rosemary, and olive oil. Spread around the bottom of the pan and place the chicken breast side up on top. of the thigh should be at least 165 degrees F.) Remove the vegetables to a serving platter. Return the chicken to the oven and broil on high heat for 4-5 minute until the skin has darkened. 6. Transfer the chicken to the platter, reserving the pan juices, and cover with aluminum foil, allowing to rest for 20-30 minutes. the roasted chicken on a cutting board, then arrange on the platter. Serve with the roasted vegetables, gravy, and any additional sides. Curious about what goes well with oven roasted chicken? Try one or two of these tasty sides to complete the meal! 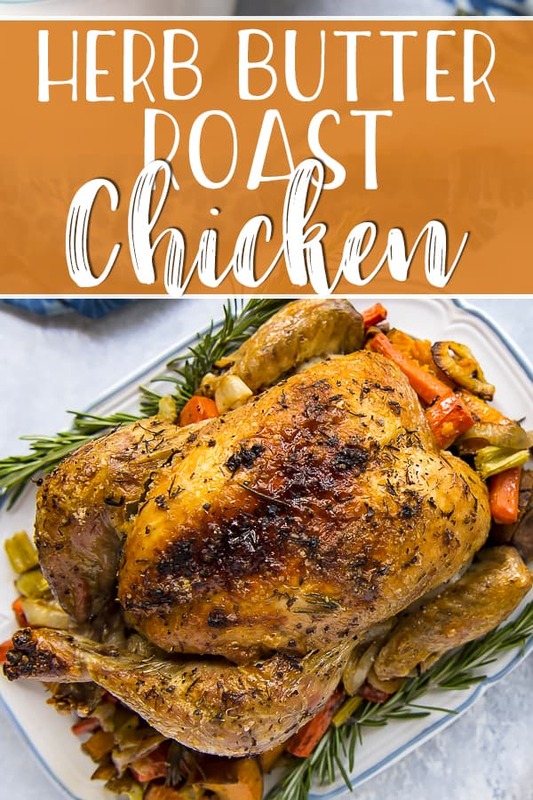 Simple and classic, this may very well be the best oven roasted chicken you've ever had! 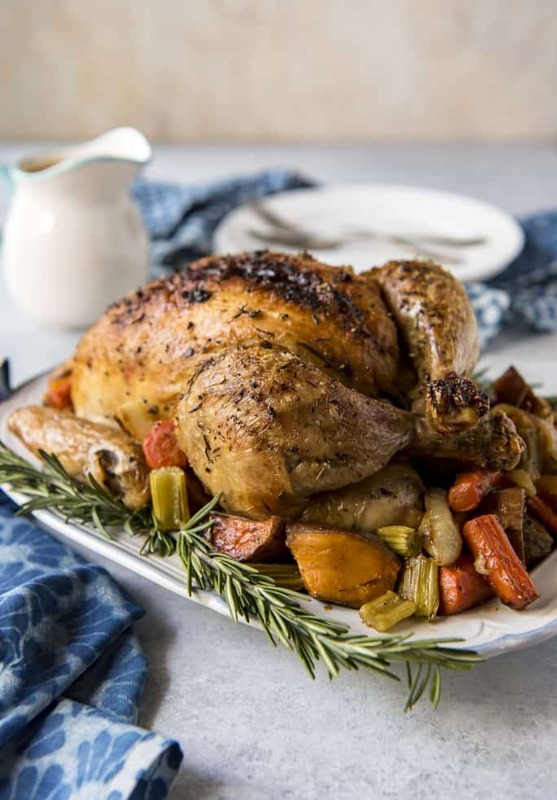 Stuffed with garlic, lemon, and rosemary, and roasted with root veggies, this heavily seasoned roast chicken recipe has a secret ingredient that keeps the inside juicy, the outside crispy, and the pan gravy extra delicious! Preheat oven to 425 degrees F. Prepare the herb butter and chill. Remove the giblets from a 5- to 6-pound bird. Pat the outside dry with paper towels. Season the inside of the chicken liberally with salt and pepper, then stuff the cavity with rosemary, lemon halves, and garlic cloves. Carefully pull the skin up from the chicken and rub the herb butter in between. In a small bowl, melt 1 tablespoon of the herb butter, then whisk together with 1 tablespoon of olive oil. Brush the outside of the chicken with the butter-oil blend, then season with salt, pepper, and poultry seasoning. Truss the legs together with kitchen twine, and tuck the wing tips under the body of the chicken. Place onions, carrots, celery, and sweet potatoes in a roasting pan. Toss with salt, pepper, chopped rosemary, and remaining olive oil. Spread around the bottom of the pan and place the chicken breast side up on top. 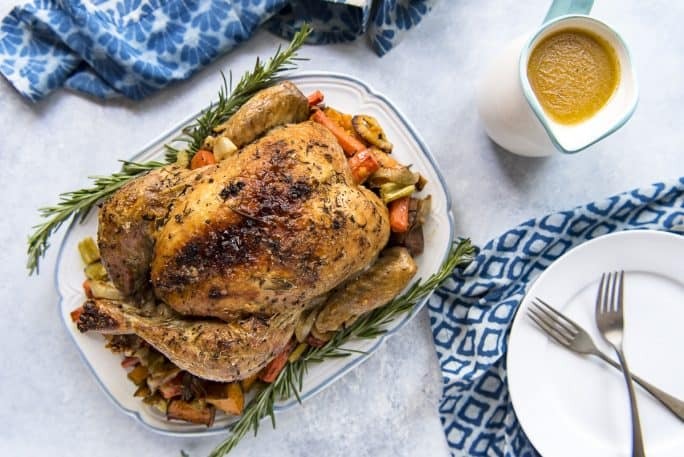 Roast the chicken for 1 1/2 hours, or until the juices run clear when you cut between the thickest part, a leg and thigh (the internal temperature of the thigh should be at least 165 degrees F.) Remove the vegetables to a platter. Return the chicken to the oven and broil on high heat for 4-5 minute until the skin has darkened. Transfer the chicken to the platter, reserving the pan juices, and cover with aluminum foil, allowing to rest for 20-30 minutes. While the chicken rests, prepare the pan gravy with the reserved juice. When ready to serve, slice the roasted chicken on a cutting board, then arrange on the platter. Serve with the roasted vegetables, gravy, and any additional sides. Pour off all but 2 tablespoons juices from the pan, then place the pan on the stovetop. Cook the remaining drippings over medium-high heat 1-2 minutes, until bubbling. Add the flour and cook, stirring constantly for 1 minute. Stir in water and bring to a simmer, stirring constantly and scraping up brown bits from the pan. Cook until thickened, about 3 to 4 minutes. Stir in butter and lemon juice, then season with salt and pepper. Strain through a fine-mesh sieve into a bowl. Fold garlic, herbs, salt, and pepper into softened butter with a rubber spatula or fork until well combined. Place whipped butter on a square of plastic wrap. Carefully roll it into a log shape, twisting the ends of plastic wrap to seal the butter. Chill for 30 minutes to 1 hour before using, keeping refrigerated until ready to use. For long-term use, store in the freezer, cutting off discs as needed. 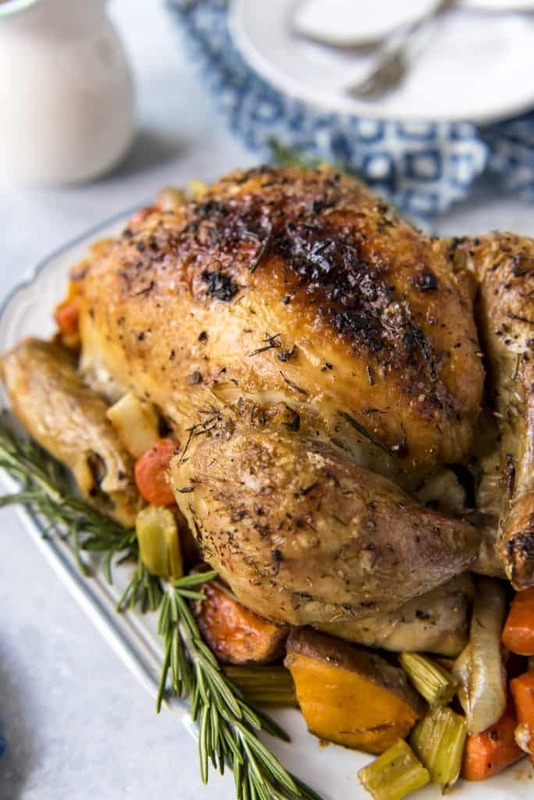 PIN THIS JUICY ROAST CHICKEN RECIPE FOR LATER! That looks SOOOOOOO mouthwateringly delicious! That chicken with the gravy looks hard to resist. I would eat it at the kitchen island too!